Last week I shared a recipe for Hot Lemon Water and the health benefits of incorporating it into your daily regimen. 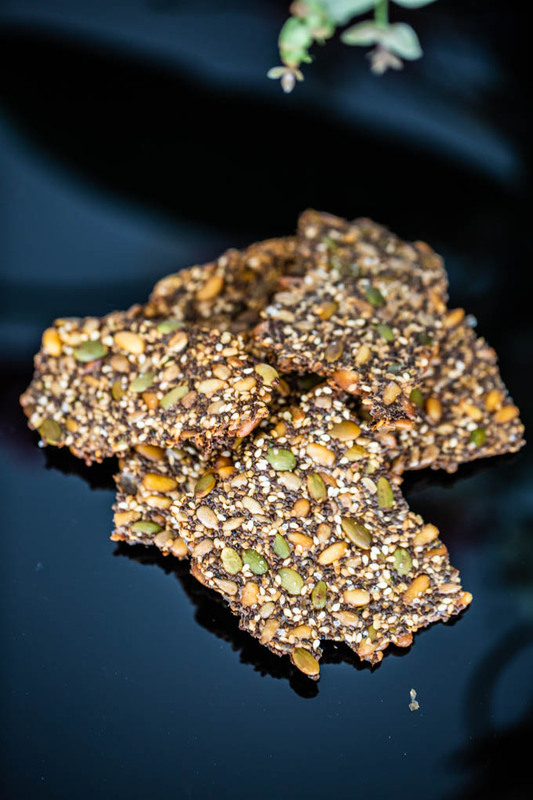 I learned about Hot Lemon Water after over indulging in these super healthy and flavorful Multi-Seeded Crackers. 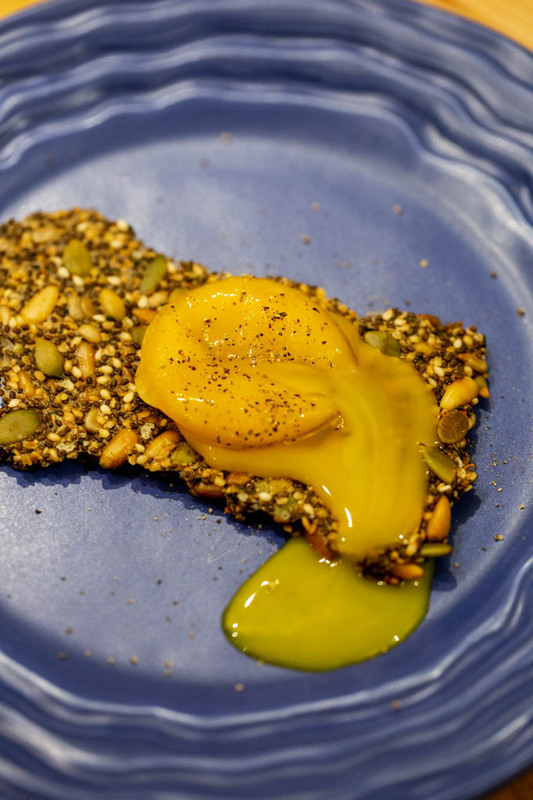 The last thing I want to do is sway you away from trying these Multi-Seeded Crackers. They are so easy to create and ideal for healthy snacks, a party, or to use with dips, spreads, or simply on their own. My issue was I ate way too many. They were so tasty I literally couldn’t stop until I realized I didn’t leave time for the seeds to digest, and basically backed up my stomach. I don’t want to alarm you, but I had also gone to the movies the night before and had a small bag of plain popcorn. Since popcorn is known to take close to a month to get through ones system, I am assuming that had some role in my system not functioning as it should. As I’ve gotten older I’ve also found that I don’t tolerate bread as well or anything that uses flour as a main ingredient. While that doesn’t stop me from eating bread completely, I do ration it. 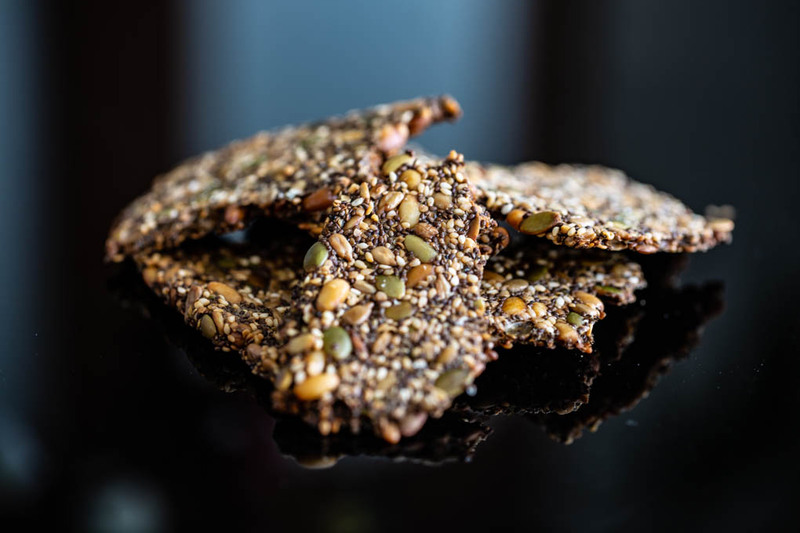 When I started seeing recipes posted about these seeded crackers from Angie @ Angies Recipes, then Sue from The View from Great Island and Chris from The Cafe Sucre Farine, I knew I had to try these. 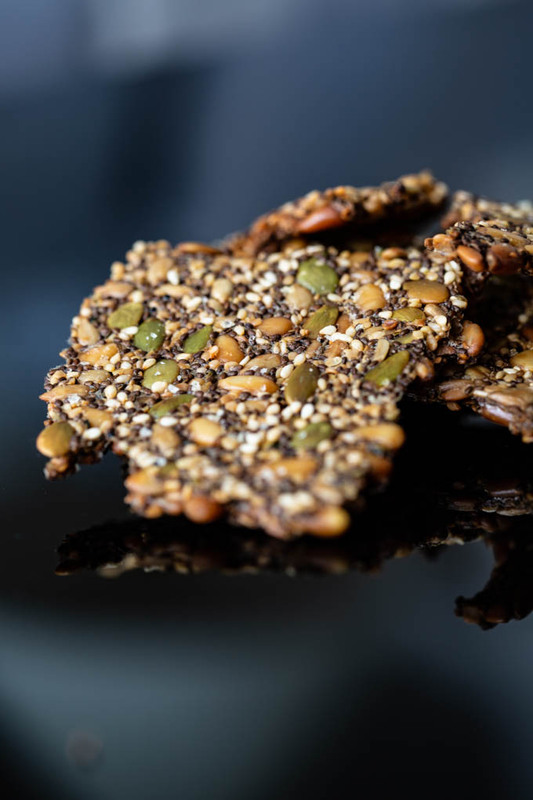 What I love about these crackers is you can create them any way that suits your palate or would compliment your meal. or any other combination you can think of. While I haven’t tried it, I’m sure even coconut water would work adding even more health benefits. 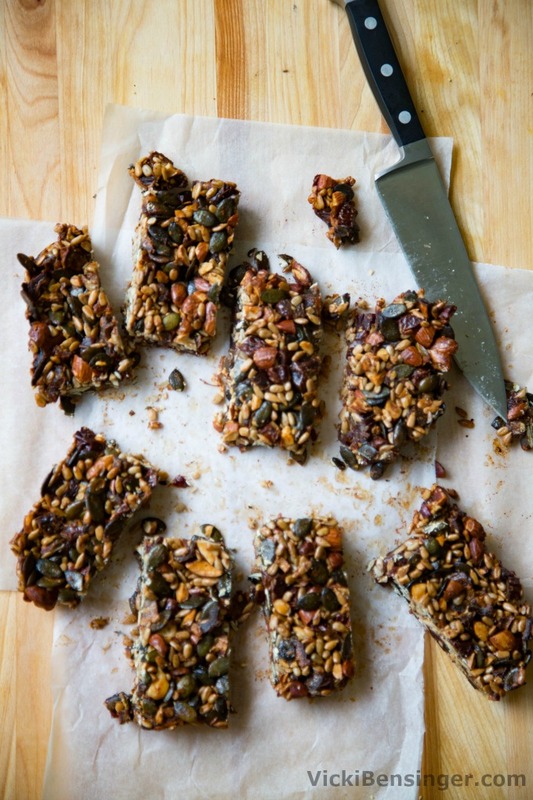 The key is to use about 3 cups of seeds. I’d try to use a good variety, and if you like, feel free to add an occasional nut or two to the mix. In the photo here I did use some olive oil, and think even avocado oil would be nice too, except, after several days the crackers began to look a bit soggy even though they didn’t feel that way. I’m guessing the oil spread out more among the crackers giving it that appearance. Since seeds already have oil in them I don’t feel it’s necessary to add more, however it does add an additional element of flavor. The health benefits of all these seeds will blow you away. Just remember to take it easy with them. Do not over indulge which is hard not to do since they’re so good! If you have diverticulitis you definitely need to avoid these. 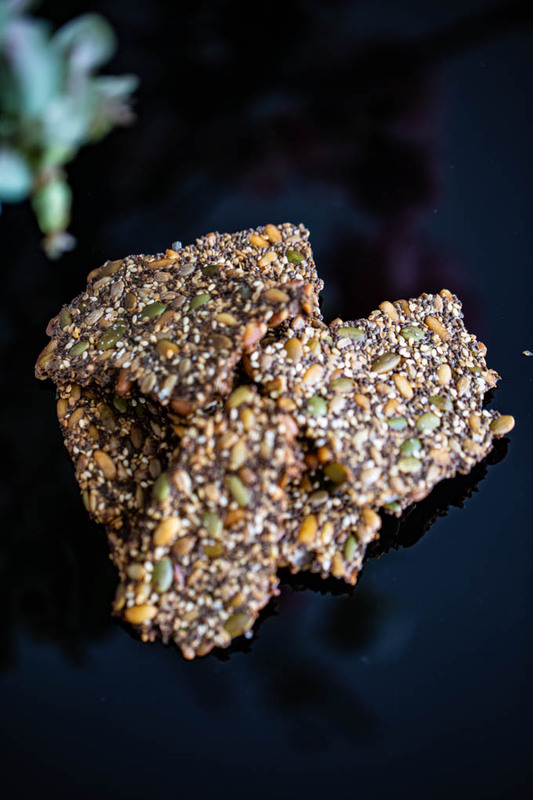 When using Chia seeds which are in this recipe, always be sure to allow 3-5 minutes for the liquid to absorb into the Chia seeds. If not, you stand the risk of the Chia seeds expanding in your esophagus on the way down, which can cause them to block your airway. Chia seeds will expand up to 27 times their weight when liquid is added to them. So it’s always important to allow sufficient tine for them to absorb the liquid to save you a trip to the ER. 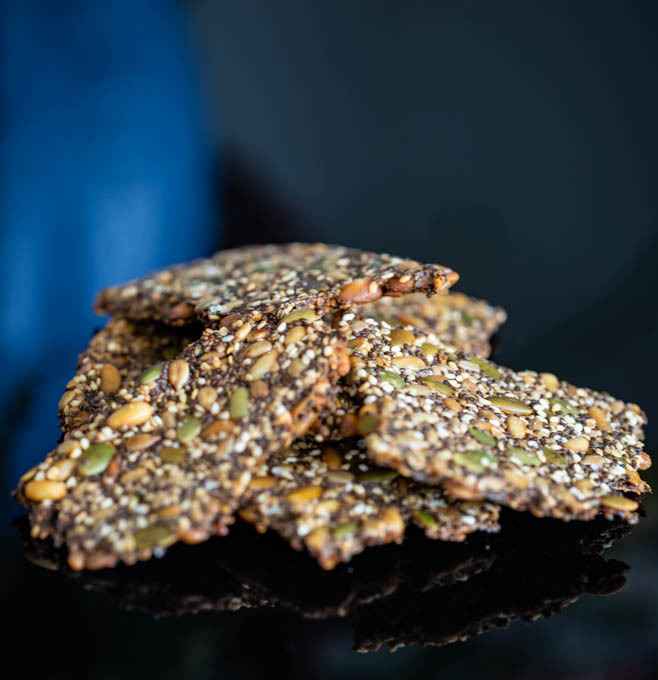 The recipe below for Multi-Seeded Crackers is super easy and healthy. I hope you’ll give these a try. I know you’re going to love them! Who said a cracker has to contain flour in order to be tasty? 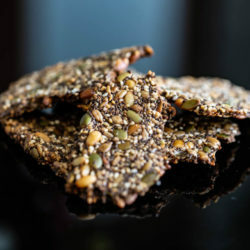 With this simple recipe for Multi-Seeded Crackers you'll never miss the flour or gluten, because they're so incredibly flavorful and crispy!!! Line two sheet pans with heavy-duty foil, then top with parchment. Feel free to omit the foil but I am not a fan of cleaning pans and the foil eliminates that step. Mix all ingredients in a large bowl. Add liquid ingredients (water, oil (if using) and honey (if using). Mix together and allow to sit for 3 to five minutes. 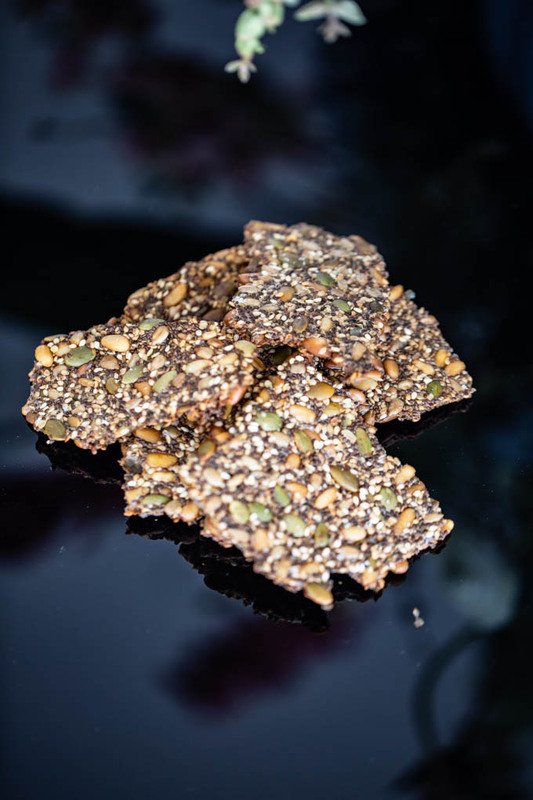 During that time the Chia seeds will expand while absorbing the liquid, and create a gel like substance that will help to bind the seeds together when baking. Divide seed mixture between the two sheet pans, spreading out with a silicone spatula into a thin layer. (Don't make the layer too thin where they become too fragile when picked up but not too thick either). Reduce heat to 275F degrees and bake for 1 hour or if using a convection oven for 50 minutes. Turn oven off and leave in the oven to crisp up for an additional 30-45 minutes. 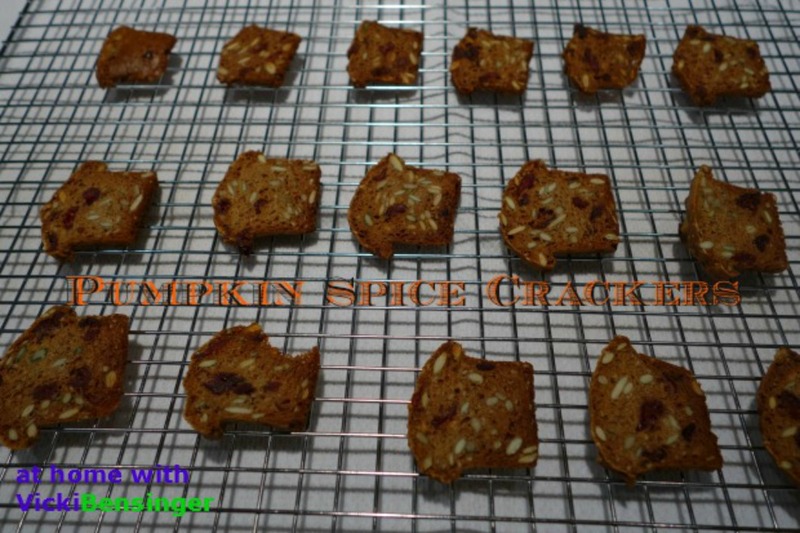 Remove from oven and break into cracker size pieces. Serve immediately or store in an air tight container for up to 1 month, if they last. Enjoy!!! I love these crackers! So good, ain’t they? Thank you so much for the shout-out, Vicki, and yours turned out absolutely perfect. Terrific looking recipe! And fun photos. Thanks!